I don't usually read romance novels often, but I picked up The Original Heartbreakers series by Gena Showalter on a whim a few years ago, and I haven't stopped reading the series since! I read the first three books in the series a while back, and when I discovered that additional books would be released, of course I HAD to check them out! 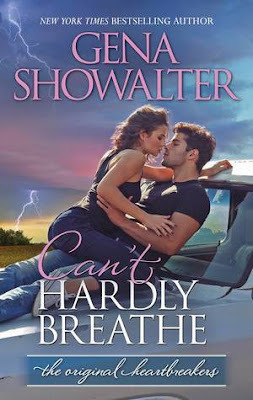 Can't Hardly Breathe is the first of the newest books, and I really enjoyed reading it! There are a new set of main characters in this next set of books, though we've met most of them in the previous books. Can't Hardly Breathe is Dorothea and Daniel's story, both of whom we met a few books back, and I have to admit, I was pretty curious for their story! It was not at all what I expected, but it was an enjoyable read! The storyline follows along the same line as the previous books, and is set in the same town of Strawberry Valley, Oklahoma. I actually really love that this is series continuing along, and I especially enjoy seeing the characters from the previous books throughout the story as well. I have only read a handful of series that are like this, and I really enjoy the feeling of familiarity so much. Overall; Can't Hardly Breathe is a great continuation to what is an already very enjoyable series! I'm really looking forward to reading the next book in the series, which was just released into the world last week, and the last book, which is due to release in December! If you're in the market for some fun, fluffy reads, definitely check out The Original Heartbreakers series!